Now that you’ve had your hair transplant with Parsa Mohebi Hair Restoration, here are a few things you should know following your procedure. Dressing: Most people will leave the office with a dressing around their head to help keep the necessary pressure on the donor area. We will remove the dressing for you the day after your hair transplant just prior to your hair wash. You will not need a dressing after the first day. Appearance: As part of the normal healing process, you may experience some redness and swelling in the transplanted and surrounding areas. This redness and swelling may increase and remain up to 4 days after hair transplant. The swelling will usually go away after day four. You may wear a hat for the first few days (or until the skin inflammation has receded). To reduce the swelling of the forehead, you will need to sleep in an upright position (elevate your head from the level of chest using a recliner or several pillows at night). We will provide you with a neck pillow in your post op bag to help keep your head in a comfortable position for the first few nights after the procedure. Medications: You will be prescribed pain medication after your hair transplant in addition to a sleeping pill. Steroid pills may also be given after your hair transplant to minimize the swelling. Please use them only as instructed on the bottles. Activity: Normal, non-strenuous, daily activities can be resumed the day after hair transplant. Hair Wash: We would like to wash your hair and examine you the day after your hair transplant. During this time, we’ll teach you how to wash your hair the first 5 days after your hair transplant. In order to assist in healing the transplanted areas, you need to wash your hair as instructed twice a day using the shampoo and sponge we provide to help remove all scabs. Do not rub or scrub the transplanted area. You are allowed to dab it with the shampoo foam. You should leave the shampoo on your scalp for 2-3 minutes at a time and then rinse it by gently pouring water on it. The transplanted area could be dried by a gentle application of pressure using a folded paper towel. Do not rub or scrub the transplanted area while washing or drying for the first 5 days. Washing: You can begin using regular shampoo and wash both the recipient area and donor area thoroughly as you may have before the transplant. If you still have scabs on the transplanted area after day five, continue washing your hair twice a day while leaving shampoo on longer (10 to 15 minutes) until all scabs are gone. Follow Up: FUE transplant patients will need to be seen by the doctor within two weeks of their transplant. Strip transplant patients, who received sutures or staples in the donor area, need to be seen and evaluated within ten days, unless recommended otherwise. Exposure: Getting a sunburn can damage the transplanted hair. For the first six months after your procedure, you need to avoid exposing your transplanted area for no longer than 5 minutes to direct sunlight. You must wear a hat or sun block (SPF 15 or above). Hair Cycles: Newly transplanted hairs typically fall out about two to three weeks after the hair transplant. Do not worry if you see hair shaft of transplanted hair fall. The reproductive part of follicles is still in the skin and will grow new hair after a few months. Early Growth: The new hair will gradually begin growing in after approximately three to six months. Some normal variation occurs between patients. Some hairs will start to grow faster than others and will continue to grow thicker and thicker as you advance to 12 months after the hair transplant. Full Result: The growth of new hair should be complete in about eight to twelve months after the hair transplant. 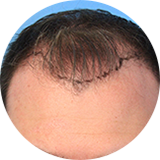 Your final visit to evaluate your hair growth will occur twelve months after your hair transplant. Others: You may see small inflammatory pimples within the first 6 months of your hair transplant in your donor or recipient area. They are called folliculitis. Folliculitis does not affect growth of your transplanted hair. Seeing a few of them is not unusual, but if they don’t go away within a few days, they could easily be drained in our office. If you have emergency questions the night after your procedure, you can call Dr. Mohebi’s emergency line. Please be advised that this number is only reserved for the patients who had a procedure and for the night after their procedure. Please use our office number for other inquires. If you have any problems communicating with us in emergency situations, please call 911. Our goal is to serve you better. Please feel free to send us an email to feedback@ParsaMohebi.com if you have any comments or concerns. We hope you’ve had a wonderful experience with our team at Parsa Mohebi Hair Restoration. We look forward to seeing you in the future. What to expect and what you should do after a FUT hair transplant? What you need to know and what you should do after a FUE hair transplant?